US Signal, a network and cloud hosting provider, has broken ground for a new 20,000-square-foot, state-of-the-art data center in its hometown of Grand Rapids, MI. The new facility, expected to open in July 2014, will be the first purpose-built data center in the West Michigan area with expansion capabilities for up to 40,000 square feet. 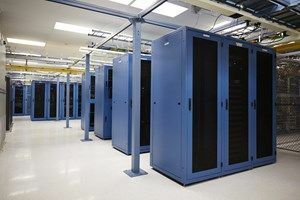 The new data center will add a new network hub to the existing seven U.S. Signal Midwest-based data centers and increase access points for its Cloud Hosting product suite. Over the past ten years, the company has invested substantial capital to build its 14,000-mile Midwest fiber optic footprint within its 10-state region which currently connects seven of its own data centers, providing end-to-end solutions for both network and cloud customers. "Our new data center will add greater capacity to keep up with customer demand," said Dave Wisz, executive vice president of operations for Grand Rapids-based US Signal. "Our data centers are all located in the Midwest, and make it possible for our customers to transmit and house their data entirely on our network and within secure facilities." In addition to enhanced product offerings, the facility will provide customers access to more than 600 POP sites and multiple carriers, as well as multiple physically diverse and protected fiber routes. Customers will experience state-of-the-art technologies and the capability to deliver up to 100G services, over redundant DWDM, SONET, Ethernet, and MPLS architectures. Because the facility is being built from the ground up specifically for complex and secure data center operations, US Signal will benchmark to Tier 3 standards, while also incorporating certain Tier 4 standards.